The epistles of the New Testament prove conclusively that the great apostasy was in the first century, just as Jesus predicted! Yes, but... In previous installments, we have demonstrated that Jesus predicted the Great Apostasy, and that the NT epistles document the fulfillment of his prophecy. 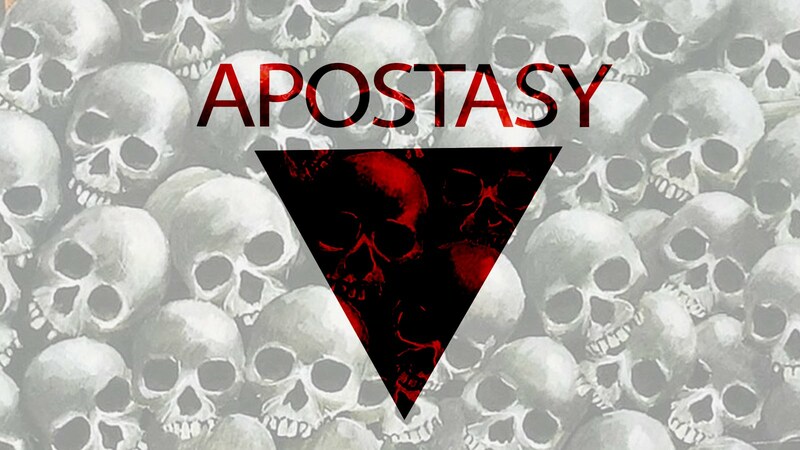 It is common to hear some one say that yes, an apostasy did come in the first century, and it is even true Jesus came in the destruction of Jerusalem; but those fulfillments were only a shadow or type of the yet future apostasy or final coming of Jesus. We would ask, for the scriptural authority for this? Are we today living in the age of type and antitype or the age of the reality? Scripture patently says it was the Old Covenant world that was the world of shadows versus reality, Colossians 2:16-17. The Old Law was a shadow of good things to come, not the New, Hebrews 10:1-4. Christ and his kingdom is the substance not the shadow. Those who suggest the Great Apostasy and destruction of Jerusalem were but types or shadows of yet future events must ask the question, what else is a type or shadow? Is the church but a type of something yet future or is it the fulfillment of the OT shadow? The table of shewbread in the Temple was a type of the Lord’s Supper. So, is the Communion now the type or shadow of what? The Passover Lamb was a type of Christ’s sacrifice — of what is Christ’s death a shadow; will there be another sacrifice? Some concur that there was an Abomination of Desolation in the fall of Jerusalem, but it was only a type of the “real one” in our future. And if the Abomination of Desolation was typological why not the Great Tribulation surrounding the fall of Jerusalem? Perhaps there is to be another Tribulation after all. (I should note that many leading Amillennialists and Postmillennialists absolutely reject the idea that there will be another Great Tribulation. See my book mentioned below for documentation). Upon what basis can that be denied if one takes the fall of Jerusalem as a type of a future coming and judgment? Once a person suggests we are still living in the age of shadow and type where does it stop? It might be rejoined that Christ’s sacrifice was not a shadow of something else yet future because Scripture says he died once for all (Romans 6::9). He appeared once in the end of the ages to put away sin (Hebrews 9:26). The word rendered “once” (Greek-hapax) signifies “once for all time”. Therefore it might be argued that Christ’s sacrifice cannot serve as a type. But consider this. To argue that the fall of Jerusalem is but a type of the “final judgment” is to deny Jesus’ emphatic statement about the significance of Jerusalem’s fall. 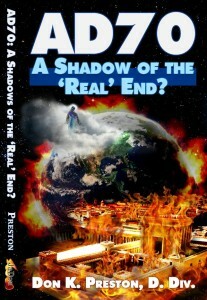 See my book: AD 70: A Shadow of the “Real” End? This book is a definitive, total refutation of the claim that AD 70 was a type of another coming of the Lord, at the “real” end of the age. Wayne Jackson, out-spoken critic of Covenant Eschatology, has argued that Realized Eschatology violates a fundamental rule of typology. He correctly observes that types were always inferior to the antitype; there is a progression from lesser to greater. Jackson then argues that since the flood was greater in scale than Jerusalem’s fall the latter event could not be the antitype of the former. Jackson’s emphasis on the physical proportions of the flood as opposed to the physical proportions of Jerusalem’s fall widely misses the mark. The “greater” aspect of the type-antitype comparison is not the physical; it is the covenantal significance, the meaning of the events. In Matthew 24:21 Jesus said there would be tribulation “such as has not been since the beginning of the world until this time, no, nor ever shall be.” Significantly, Jackson applies that verse to the events leading up to and consummating in AD 70! If there is a future “end of the world”, would that not be greater, in both physical and spiritual proportions than the destruction of Jerusalem? Indeed! In that sense it would fit the type-antitype comparison. But it would also be a direct contradiction to Jesus’ words. He said the fall of Jerusalem would be the greatest that ever would be — past or future. There cannot be, therefore, a future greater Tribulation, or Jesus will be found a liar! After all, would not the “end of time”, and the end of the Gospel be far greater than the end of the Old Covenant age? The argument that the fall of Jerusalem was but a type or shadow of the final coming is therefore found to be in direct contradiction to Jesus’ words in Matthew 24. And this brings Jesus’ prediction of the Great Apostasy into sharp focus, for that Great Apostasy is inextricably tied to the end of the age.